A dedicated recording appliance designed with new hardware and software. Works seamlessly within Suite 7 and provides an upgrade path to Suite 8. Capture your live proceedings with this dedicated recorder. Recorder 8 SD is a network enabled, hardware recording appliance designed specifically for dedicated audio video recording. 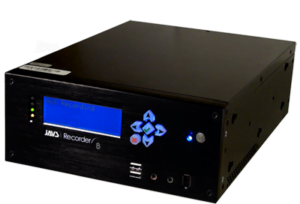 Recorder 8 SD connects directly to a JAVS Centro AV Processor, P412, or other AV source and captures the live meeting in a secure, standards-based, digital multimedia file in either Stereo or Multichannel audio configurations. Recorder 8 offers higher video quality for customers, up to 640x480 in need of high-end video recording and strict security. Front panel controls make operating this device a breeze, while the LCD display clearly indicates record status. Record either in stereo audio or up to five separate channels of audio in a secure environment. Use multiple recorders to provide fault tolerance in the event that a recorder fails. Over 18,000 hours of recorded sessions can be stored on the internal hard drive. The application programming interface (API) allows you to develop your own software/hardware to integrate with Recorder 8. 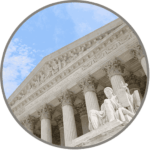 With the API, you can push data from your database systems into the JAVS database at the time of recording or have control over the recorder in your own applications. and provides an upgrade path to Suite 8. Capture your proceeding with this dedicated HD recording appliance. Recorder 8 HD is a network enabled, hardware recording appliance designed specifically for dedicated HD audio and video recording. Recorder 8 not only captures HD audio and video events, but verifies their authenticity with built-in OSD generation for time/date stamp. When connected to a JAVS audio processor, microphone tallies and system mode information is also embedded into the video to provide on-screen system information to all users. Capable of recording in any 16:9 aspect ratio with stereo or multichannel audio recording, the Recorder 8 HD captures wide-screen video formats to deliver impressive video quality. Every record session is either 720p, 540p or 360p to provide the best resolution size needed for review.